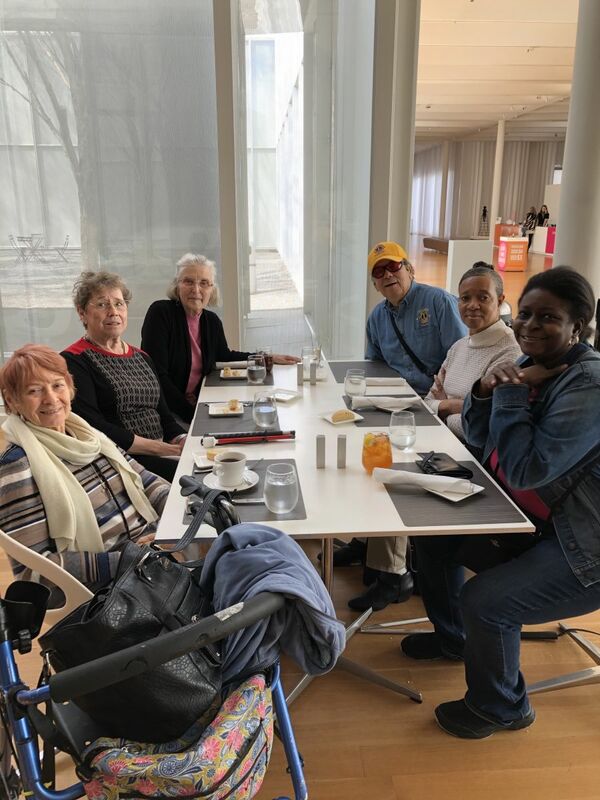 Lion Dale Graham, North Raleigh Lions Club Lion Tamer, volunteered to drive five people who are blind or have low vision to a Docent Tour of the North Carolina Museum of Art. Everyone had a fantastic time, including Lion Dale. 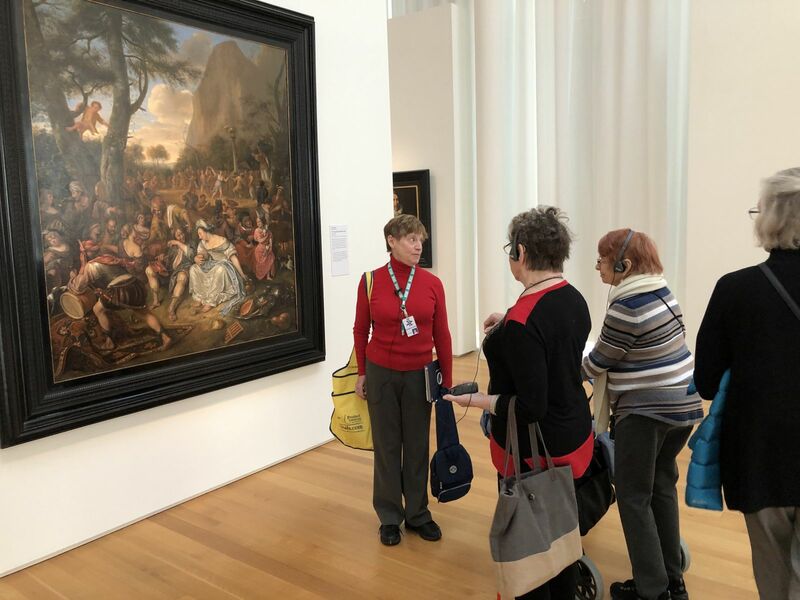 The tour was arranged by Beth Shaw McGuire, the North Carolina Museum of Art Docent Tour Director and was led by Docent Volunteer Guides, Elizabeth Kahn & Donna King. The North Carolina Blind Lions are a group of Lions who happen to have vision problems. Their vision ranges from some peripheral vision to no vision at all. They all, however, have a common goal to make the world a better place to live for people with vision problems. one of the first things the NC Blind Lions noticed was that most programs for the blind are designed for people with some vision,. This has an inherit problem. Solutions designed for people with low vision will not work for the significantly blind, however, solutions designed for the significantly blind will work for the low vision. 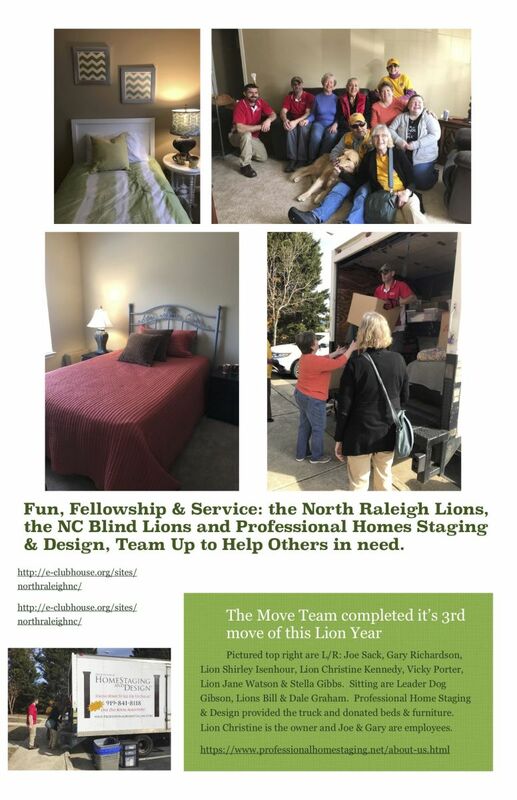 One of the main goals of the NC Blind Lions is to stress that solutions should be designed for the significantly blind so that all people with vision problems can be served. To this end, the NC Blind Lions have undertaken a project to make Camp Dogwood more accessible. The project included mapping the Camp Dogwood Campus in Open Street Map and placing blue tooth low power beacons in the Camp Lodge for indoor navigation. The project also included working with Duke University to develop a 3D Printer object that can serve as a tactile map of the Camp[ Dogwood Campus. This will assist campers in using a way-finding app, Nearby Explorer, to be able to locate the various buildings on the campus. North Carolina Blind Lion Bill Graham attended the first session of 2018 Camp Dogwood to deliver the 3D Printer objects and to hold a training session on on how to use the Nearby Explorer way-finding app. Lion Bill Graham was quoted as saying, “This was a good start in making Camp Dogwood more accessible for all campers. We learned a lot and we hope to make some changes that will make Camp Dogwood one of the most accessible facilities in the USofA”. One of the more interesting things we discovered is that we will likely have to address two groups of users: those that are low tech and those with some technology skills. 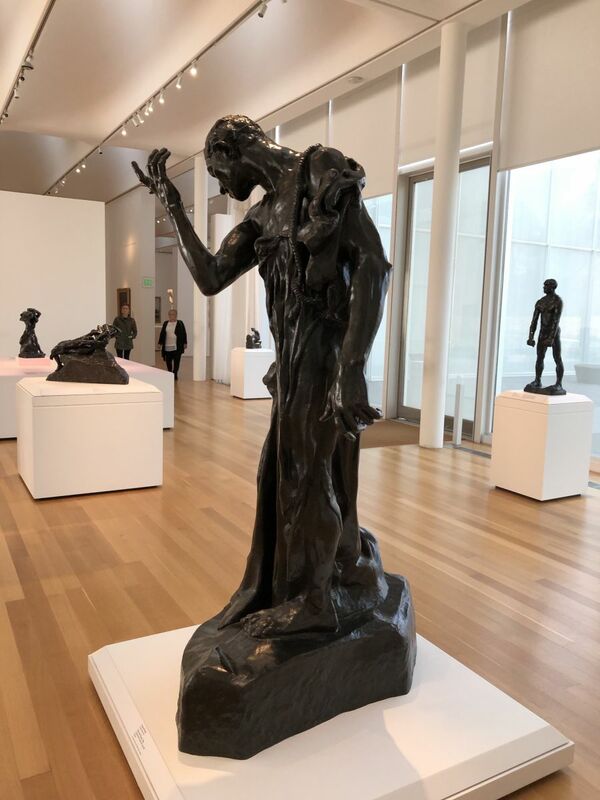 The tactile aspect of the 3D printer object made it useful to both groups, but low tech users cannot take advantage of the features of the way-finding apps such as Nearby Explorer. We will likely have to explore the use of audible adaptive aids to help the low tech users. We also discovered that there is a great need for training of these low tech users on the benefits of smart devices. To our amazement, many people with smart phones or tablets did not realize the adaptive potential built into these devices. The next phase of the project involves making a tactile map of the Camp Dogwood Lodge. This will be another 3D Project that will be developed in association with Duke University. Also, we will develop a video which will be posted on uTube that is a training tool for how to use the various adaptive aids at Camp Dogwood. Lion Peter Crumley, Beaufort Lions Club, has written an excellent document - Title: Technology to Aid the Visually Impaired to Achieve an Independent Lifestyle in the 21st Century. This document lays the foundation for how technology is now able to give the blind & visually impaired an opportunity for new freedom never experienced before. Lion Peter will follow this initial document with a detailed description of some initial smart device apps that allow this new freedom. Peter hopes this will be a “living” set of documents that will be continually updated as new software & technology come online. Lion Peter further argues that Lions Clubs should rethink their strategy of helping in the prevention of blindness to include helping the blind & visually impaired in obtaining these apps. For example, the KNFB smart phone app costs less than a pair of eye glasses and will allow people who are blind or visually impaired to read a document. Follow the link below to read Lion Peter;s entire document. It is a Great Read! End of list (Version 1.0) including 20 apps. To learn more about the individual Apple applications listed above refer to companion document; authored by Peter Crumley, titled "List of Essential Apple Applications for the Blind". This referenced document expands the knowledge of Apple Applications listed above for the defined Blind visual group with a description of details, examples of usage and cost for each highlightedApp. This list will change and evolve over time as new Apps are developed, while other Apps that are currently available; but not appropriate for use by the Blind, are updated to an acceptable level of functionality allowing them to be included for recommendation for use by the blind. 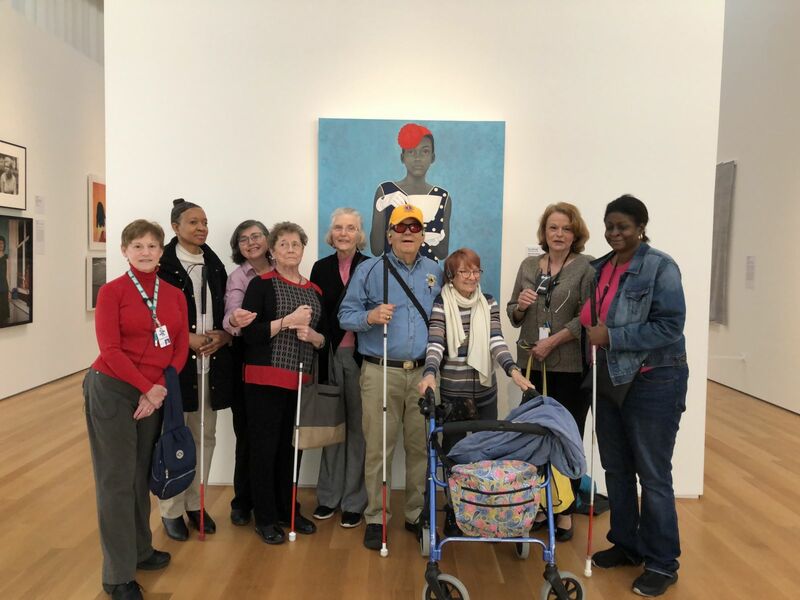 Second, we want to improve the lives of all North Carolina Visually impaired Persons by offering Presentations, Discussions Groups & Peer Support. These presentations will be offered in an accessible manner for VIPs. The broarder VIP community will have a voice in what presentations are made. we want to create an environment where people with impairments can participate, learn, grow and have leadership positions without worrying about what the people will think. We hope to have a very safe and welcoming environment. We will have conference calls on the 1st & 3rd Tuesday of each month at 7:00 pm.